When you need to apply or print and apply a large label, FOX IV is the company to call! We have several models of label printer-applicators and label applicators to apply your large label to pallets, drums or bags. Labels up to 8.5″ x 14″ have been successfully applied automatically using our industrially designed labeling systems. 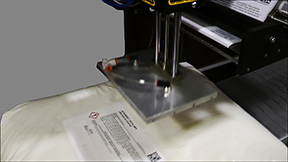 For applying fully printed labels, FOX IV offers the 1016 and the 1018 label applicators. 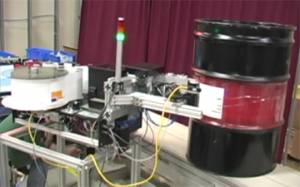 The 1016 can apply labels up to 6″ wide while the 1018 can apply labels up to 8.5″ wide. 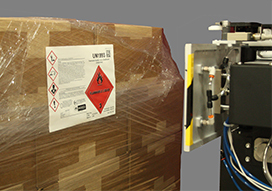 These are perfect units for GHS labeling, pallet labeling, drum labeling and direct to product labeling. If you want to PRINT and Apply labels, FOX IV has several models of 6″ wide and 8.5″ wide print and apply units. Six inch wide units include Modular print and apply units with Zebra, SATO or Datamax OEM print engines as well as several of our Standard Body size units. For 8.5″ wide print and apply, our Model 5422 with a Zebra industrial print engine is the go to unit for reliable, quality performance.